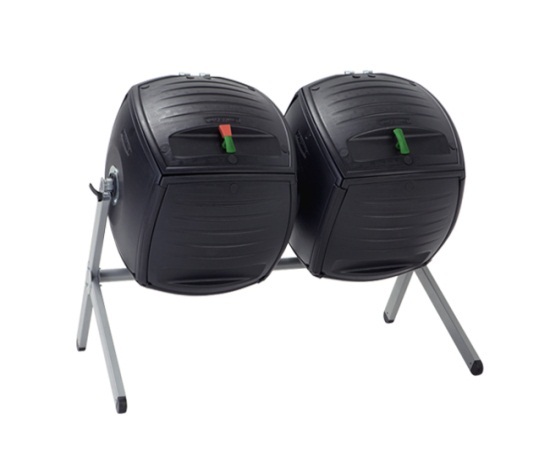 Lifetime Yard Equipment - 60072 Dual Composter. Free shipping to the lower 48 States for this Lifetime gardening composter. Lifetime composter 60072 feature 2 tumbler chambers to improve the speed and efficiency of your compost production. Rather than wait for 1 batch of compost to finish preparing, you can start up your next batch in the adjacent tumbler. Each tumbler has a 50 gallon capacity and an aeration bar that helps the compost keep air in the ingredients to break them down properly. The double-walled, black polyethylene helps attract heat to assist in the breakdown of composting materials. Order your Composter here. Tumbler material of construction: double-walled polyethylene plastic. Frame and aeration bar material of construction: powder-coated steel. Double-tumbler design allows for two batches of compost to be in production simultaneously. Extra-large removable lids help provide easy access to tumbler contents. Unloaded composter weight: about 83 lbs. setup dimensions: 58 inches W x 31.25 inches D x 43.75 inches H.
Lifetime Review - I'm a backyard gardener and understand the value in making your own compost. Rotating (or 'tumbling') composters are one of the best ways to make fast, nutrient-rich compost. I've tried a lot and have been most impressed with those made by Lifetime Products! I own their two other models and have been happy with them, but when I saw this double-unit I decided to swap out my tried-and-true singles for this one double. Assembly was much easier and faster than the previous two models (which weren't that difficult to begin with). It took my 11-year-old daughter and I about two-hours to put both together. I love the one-handed operation which makes these much easier to open and close, and they spin very smoothly. The cantilevered design gives you easy access to put your wheelbarrow under them and dump your compost right into it. Talk about well-thought-out!And they look good, too! 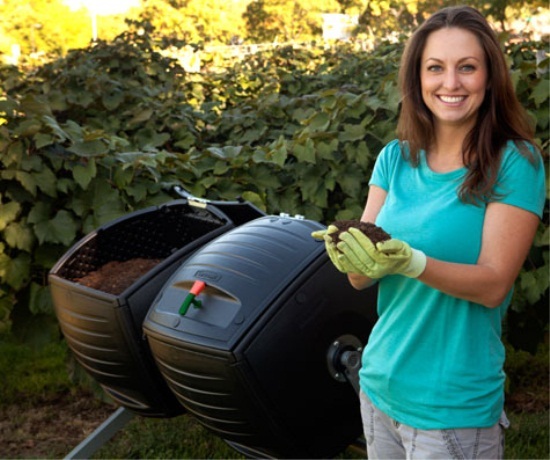 Lifetime Review - I enjoyed putting the composter together with my girlfriend. It definitely helps to have two people to put the product together. It took us about 7 hours. It was not a continuous 7 hours, but the construction took place over a period of a week. I am legally blind so there was an excuse not to get it done in 2 hours. I have it setting outside and it is already loaded with composting material. Thanks for the product. My girlfriend was excited due to the fact we did not have any parts left over. Lifetime Review - Picked this up last weekend and was totally impressed. My old composter was all plastic and collapsed under its own weight. This unit is built to last and sturdily constructed. The internal venting system should work well and it tumbles easily to mix the compost well. Told everyone at work about it and a couple of them are considering purchasing one as well. We LOVE this composter! It took my husband and me a couple of hours to put it together with only a few glitches. Some of the Joint seams can be very tight; ;which is probably a good thing. The unit has a small footprint compared to other composting methods I have used and it is easy to work. No more attempting to turn the compost with the old pitch fork. The composting instruction CD is also very helpful. We loved this unit so much that this is the second unit for us. The first one stayed with our house when it was sold; the buyers were so impressed with the composter that they insisted it be a part of the sale. Easy to assemble and waiting for my first batch! Lifetime Review - This took me 3-4 hours to put together - I was at a slow pace on a hot summer day. The instructions were easy to follow. Per other reviews, I did assemble the base on site of its final home. I can see how moving it would be difficult. I have noticed some rust appearing on one end at the aeration bar so will need to contact Customer Service. I'm a SWF who enjoys small scale gardening and do-it yourself project. I thoroughly enjoyed assembling this product and recommend it! Q: one of the buckets will not open how do get it open? Q: The door hinges have rusted on both containers and one hinge has broken off. How can I obtain replacement door hinges only? Q: I have a dual Lifetime composter tumbler but have lost one of the parts that insert into the corner of the tumblers. Without this insert, the soil slips out upon turning. Am I able to purchase this part separately? Q: Can I purchase replacement hinges for the bin doors? Mine have rusted and broken. A: Absolutely, please call 800-225-3865. Q: How can I get two hinge assemblies for my composter? Both of mine rusted and the welds broke on the hinges when I tried to open them. The welds were poorly done and the assembly rusted. Q: I BOUGHT THE DUAL COMPOSTER 3-4 YEARS AGO ... THIS WINTER THE HINGE ONE OF THE BINS BROKE. WHAT CAN I DO NOW? A: For replacement parts please call 1-800-225-3865. Q: How many gallons does it hold? A: 100 gallons in total, but not designed to be ready at the same time, one 50 gallon is processing while the other is for new material. So perhaps only 50 available at a time. That may be why it is 50 gallon PER CONTAINER. A: This has a capacity of 50 gallons. Dimensions: 46" x 24" x 11"